"I love this cheese! The nettles give this gouda a spicy flavor like peppers. ... read full review"
Made from cow's milk, this variety of Gouda Cheese is blended with bits of Stinging Nettles to enhance the flavor of the cheese paste. The Stinging Nettle is a common herb that is often prepared for use in salads or as a side dish of greens. By cooking the Nettles, the sting of this herb is eliminated as it is when prepared for use in cheese. Mildy sharp in flavor, Gouda Cheese with Stinging Nettles is a soft-textured cheese formed into wheel shapes that range in weight from 10 to 20 pounds. When paired with wine, this cheese goes well with medium-bodied red wine or dark beer. Traditional Gouda that is to be aged is covered in a yellow wax coating. As it ages the texture hardens and becomes dark ivory or caramel colored, at which point the flavor intensifies, tasting much like cheddar. 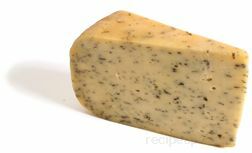 In addition to being flavored with herbs, Gouda is also available as a cheese flavored with spices such as cumin.